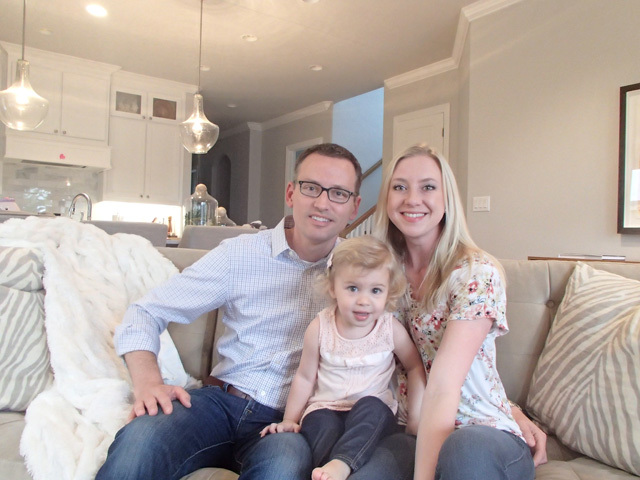 The Blythe family in their open and bright new build at 6919 Santa Fe. When the Blythe family moved to the Hollywood Santa Monica neighborhood years ago, they fell in love with the style and charm of the Tudors and traditionals in the area. But with a family, it made things quite difficult to enjoy their 1930s home on Monte Vista with a cramped floorplan. Then they found this beautiful new build (RARE!) on Santa Fe. It’s so uncommon to find a new home, because the only way you could tear down a structure in this historic conservation district is if it’s damaged beyond reasonable repair. So most new homes are on previously vacant lots or are constructed at the site of some catastrophe. When new builds blend in with the neighborhood, though, everyone wins. I love the subtle architectural details, like the high pitch of the roof and the masonry of the chimney. 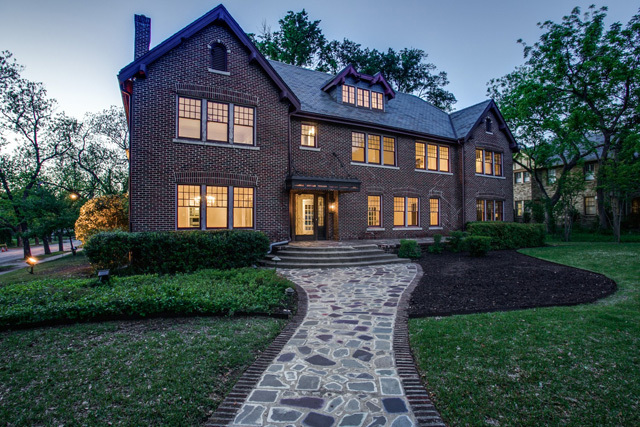 Even the stone arches in front and faceted leaded glass windows keep the home true to the neighborhood’s character. Inside, though, homeowner Kalee Blythe says it really shines! If you want to see inside this home and the other gorgeous abodes on this weekend’s Hollywood Santa Monica Neighborhood Association Home Tour, you can buy your ticket ahead of the event and save a few bucks. They’re just $15 apiece before the tour! The auction party, another big fundraiser for the neighborhood, is tonight, as is the candlelight home tour and preview party. Jump to see the Blythe’s beautiful new build at 6919 Santa Fe sponsored by Briggs Freeman Sotheby’s International Realty agent Belle Trankle. Ticket Giveaway: Win a Pair of Passes to the April 25-26 Hollywood Heights Home Tour! We’ve been profiling the incredibly dedicated homeowners on this year’s Hollywood Santa Monica Neighborhood Association Home Tour each week. You can read our profile of interior designer Emily Larkin who owns the Tudor at 707 Cordova, renovation fanatic Stacey Warnix and her beautiful remodeled Tudor on Hammond, and the lovely Caitlin and Tyler Faubion and their gorgeous cottage on Patricia. Hopefully you’ve been following along and are tremendously excited about the April 25-26 home tour. 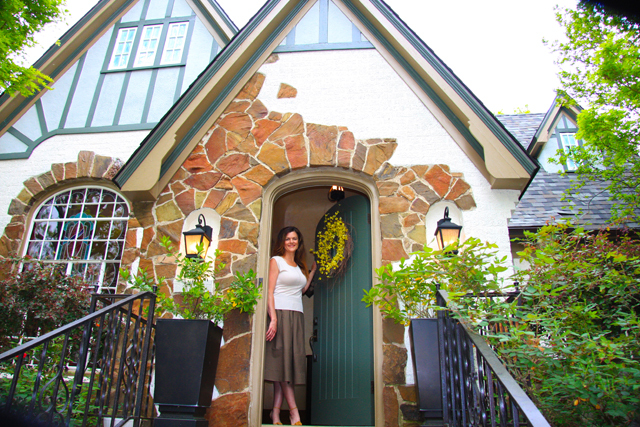 Maybe you already stopped by Curiosities and bought your tickets to this popular home tour. I mean, they’re only $15 a piece and support vital programming at neighborhood schools. Or perhaps you scored your passes online and registered for the silent auction fundraiser at the Dallas Arboretum on Friday, April 24. But if you’ve waited until now to purchase your passes, CandysDirt.com has an opportunity for you to win a pair! Jump to find out more! 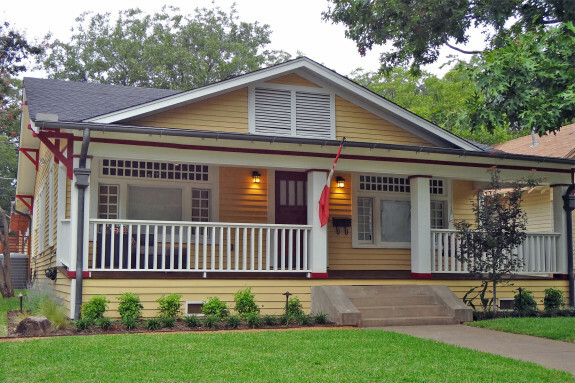 Winnetka Heights is a fabulous community that takes pride in the fact that it’s the oldest designated historic district in Oak Cliff, designated in 1981 and comprised of an amazing array of Prairie four-squares and Craftsman bungalows built in the early 1900s. Each year they put on a whimsical and fun home tour that really lights up the area. This year they’re going a step further and hoping to bring some cheer to even more houses by photographing the front doors of wreath-bedecked homes in the neighborhood during the Dec. 7 home tour. The photographs will be made into a coffee table book that will be available for sale later. If you live in Winnetka Heights and want a stylish evergreen wreath of your own, find out how you can get a locally made one from Troy Lonion here. If you want to see inside some of the amazing homes on this year’s tour, you can buy tickets for $12 each at Bishop Street Market inside the Bishop Arts District. Tickets are $15 on the day of the tour, and can be purchased at Turner House at the start of the tour. Turner House will also host a silent auction from noon to 6 p.m. during the tour, featuring items from Oak Cliff businesses and artists. Find out more about Turner House here.